Woman Walks Ahead is a 2017 American biographical drama film directed by Susanna White and written by Steven Knight. The film is the story of Caroline Weldon (Jessica Chastain), a portrait painter who travels from New York to Dakota to paint a portrait of Sitting Bull (Michael Greyeyes) in 1890. Chaske Spencer and Sam Rockwell also star. 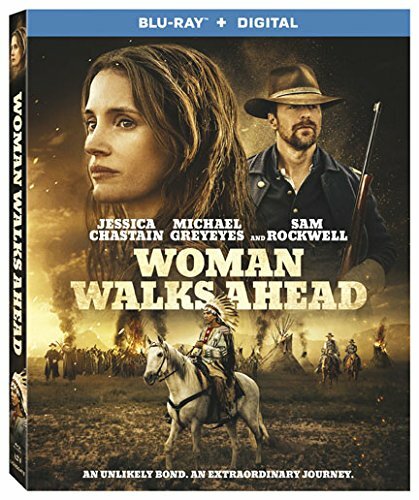 Purchase WOMAN WALKS AHEAD on Blu-ray Today! WOMAN WALKS AHEAD stars Jessica Chastain as a painter who is a recent widow who decides to leave New York, travel by train, and set off to paint an exquisite painting of Sitting Bull for it to be a likely museum hopeful. She feels the Native Americans are largely under-represented in history at that time. And right she was. She’s met with great hostility as the troops there want nothing to do with painting any Native Americans in such good light. Fresh off the wounds of the battles, and wanting any reason to spark them back up to kill off the last Chief who had any part in the raid on Custer. Catherine perseveres and stands up against the troops trying to help the Native people who are in the middle of another treaty signing where the US is trying to take more land from the people of the Lakota Reservation. Foe later turned ally of sorts Sam Rockwell plays a great supporting role of this story based on true events. It’s definitely a captivating film to see and hear of a woman who just wouldn’t take no for an answer especially back then in those times. An overall very good film that is worth a watch, if not a purchase as it’ll likely be able to be had at a reasonable price. We recommend it for those who enjoy westerns, true stories, and films that remind us of a past that shouldn’t be forgotten. WOMAN WALKS AHEAD comes to blu-ray in 16×9 Widescreen 2.39:1 ratio presentation. 1080p handles the film well enough, but the vast landscape shots at times sure seem to lend themselves more to 4K UHD. Still blu-ray is a very viable format in itself that films of this nature and/or backing not ready to make the leap to 4K UHD can still find such a quality release compared to the predecessor DVD. Lot’s of luscious colors in the wheel house on this one with the Native American art, head dress, wardrobes etc. Then also bleak muted like tones of Wyoming and North Dakota, old wild west towns, and dirt. Still the blu-ray handles all with ease. WOMAN WALKS AHEAD comes with a 5.1 DTS HD Master Audio track that handles the film quite well given that it’s not on UHD. The film has some lovely landscape shots, and with most westerns some great audio sequences that would have allowed for quite the Atmos track. Never the less the film is a bit more dialogue driven compared to typical shoot em’ up like westerns so that being said the 5.1 HD MA track suits it fine. Heavy front action in your towers (or left and rights, soundbar etc) and the center handles a good chunk of the load as well. No real complaints in the audio department. The following special features come with this blu-ray.